In 1881, Daniel Green, a young traveling shoe salesman for the Wallace Elliott Company in New York City, visited Dolgeville, New York. Daniel Green was shown a pair of felt shoes fashioned from waste pieces of piano felt which had been made in the Dolgeville Felt Mill. Daniel Green noticed that these felt shoes were worn by many factory workers to keep their feet warm and comfortable on the cold factory stone floors. Impressed by the warmth and comfort of the slippers, Daniel Green took a pair back with him to his home in Canastota, New York to show his brother William. These two enthusiastic young men returned to Dolgeville and met the felt mill owner Mr. Dolge to see if they could arrange for them to manufacture felt shoes and slippers to sell to the shoe trade. Mr Dolge agreed to make all the felt footwear and gave Daniel Green the sole agency. The Green brothers returned to Canastota, and in a room over the kitchen of Daniel Green’s house, the business was founded. Both William and Daniel Green carried samples of felt slippers, and during 1882, 600 pair were sold. The second year 2,400 pair were sold, and in 1884 they sold 24,000 pair of slippers. In 1885, the felt shoes and slippers were made with felt heels and could be worn either in the street or in the boudoir. Fancy colored felt was added with white piano felt soles and sales jumped to 75,000 pairs. With the business rapidly expanding, the company moved to Utica, New York and eventually to New York City. 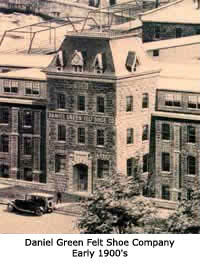 Daniel Green died in 1891, and soon after his death the company was incorporated in New York state. Over 100 million pair later, Daniel Green slippers continue to represent the very same high quality and unparalleled comfort as they did during the days of William and Daniel Green. While many of the styles remain classic and traditional, the Daniel Green slipper collection of today has expanded into a wide variety of new looks, fashion and utility for inside and outside the home. In 1804, T. & A. Evans (Thomas and Amos) were running a small shoe business connected with a general store in the town of South Reading (present day Wakefield, MA). There was no shoe factory as we know it today, just a small shop where Thomas and Amos cut the leather for their shoes. The actual shoe making was farmed out among the people of the town, Thomas and Amos supplying them with uppers, soles, counters and heels to be assembled into shoes. All shoes were sewed by hand whenever the shoemaker-farmers could spare the time. The shoemaker-farmers traded at the Evans’ store, and according to the account books, very little cash ever changed hands. In fact, a cash settlement with each individual shoe worker was made but once every six months. Customers settled their accounts every six months, too, and even here not much cash was involved. James Madison Evans entered into the business in 1832 and carried on the enterprise through 1857. Lucius Bolles Evans, the younger brother of James Madison, started in the shoe business on his own in 1841, at that time founding the present company L.B. Evans which bears his name. Lucias Bolles worked in the business until 1880 with his son Harvey B. Evans as his partner in the later years. It was during his time that shoe machinery was first introduced. After L.B. Evans passed away, Harvey B. continued the business building the strong foundation and commitment still present today. Harvey passed away in 1905, and the business was then incorporated as the L.B. Evans’ Son Company. The next generation of Evans stepped into leadership and continued with the values and commitment to quality of the generations passed. Through many wars and depressions, L.B. Evans survived. Today L.B. Evans is owned and operated as a division of Daniel Green Enterprises. Many of the traditional gentleman’s slipper styles are still part of the line, but the business has grown to include new updated classics, premium products including elk and deer, and an array or rugged, warm outdoor styles. Daniel Green Enterprises remains committed to the quality and comfort guarantee that the Evans brothers established over 200 years ago.